The June 13 2017 Outlook Security Update is causing all kinds of issues for users. Attachments won’t open, iCloud doesn’t work, custom forms don’t work. Is it dangerous to uninstall it? There is a risk, but for many people, the risk is very low. The exploit, like most, if not all Office exploits these past few years, will not run automatically – the user needs to be convinced to open the document and possibly, change security settings. "Uninstall Updates in Office 'Click to Run'"
While all four versions of Outlook are affected by the bugs, Outlook 2007 and Outlook 2010 seem to have the most issues with this update. This issue was fixed in the July 27 2017 update. The security update is targeting “specially crafted office documents” and part of the “specially crafted” applies to file names. Multiple dots and certain characters (including ?*<>|!) in a file name will trigger the Open or Save dialog, or in the case of attachments on Contacts, Tasks, Appointments, or in RTF formatted messages, a silly dialog stating that Outlook isn’t installed. The program used to create this object is Outlook. The program is not installed on your computer. To edit this object, you must install a program that can open the object. 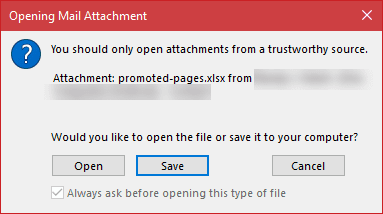 When you open an attachment, you may get the "open or save" dialog when you didn't previously. After saving the attachment to your hard drive, it should open without issue. If you prefer dragging the attachment to File Explorer, that should work too. iCloud had been working perfectly for years syncing with Outlook until yesterday. When I started getting this message: The set of folders cannot be opened. An unexpected error has occurred. MAPI was unable to load the information service C:\PROGRA~2\COMMON~1\Apple\INTERN~1\APLZOD.dll. Be sure the service is correctly installed and configured. The usual fixes of signing out of iCloud and signing back in or reinstalling iCloud won’t fix this problem. Add one of the following registry keys to allow iCloud to load. You will need to restart Outlook for the key to take affect. Users are complaining about published custom forms too. VBScript and some controls are blocked. I have a custom form that's published to my personal forms library that I use for new contacts. When I create a contact, I get the following message and the VBScript behind the form doesn’t run. If I uninstall the security update the problem goes away. "To help prevent malicious code from running, one or more objects in this form were not loaded. For more information, contact your administrator." As with the other problems, the short-term solution is to uninstall the security update. I haven’t discovered any issues between the security update and BCM, however, an old issue with the Microsoft Chart controls is popping up again, most likely due to .NET framework updates. When the chart controls are missing or corrupted, the BCM dashboards won’t display and Outlook may crash. Reinstalling the chart controls will fix it. The KB articles related to the non-security updates released in June 2017 for Office 2013 and Office 2016 applications and available through the Download Center and Microsoft Update are available in the following article at Microsoft TechNet. These downloads are for organizations with "MSI" installations; these updates are installed automatically in Office 2675 subscription software. Diane: thanks for the great Registry mod suggestion. Added your consumer route, however, did not have any effect on the problem. Still get the nasty "set of folders cannot ... " pop-up. Any other suggestions please? Which version of outlook? If 2010 or newer, reinstall iCloud. It definitely should work with 2007. Did you sign out of icloud or untick Sync calendar & contacts before removing icloud? That should have removed it... otherwise, go to File, Account Settings, Data Files tab and delete the icloud data file. Log into icloud.com - are the appointments there? If not, the problem is on the phone. First thing to check is that the appointments are added to the correct calendar on the phone - this shouldn't be a problem if there is only one calendar, but can be if you have multiple email accounts. Hmmm. If they are in icloud.com and sync up works, sync down should work too. The usual cause is the phone is using the wrong calendar as default, and nothing syncs to the icloud.com server, which means it won't sync to outlook. I would try signing out of icloud in outlook and sign back in. I deleted the .aplzod data file and then "repaired" iCloud for Windows (v7) and PRESTO!! Let's hope it continues to work! I made the Registry Change as recommended to allow my icloud.com contacts and calendar to be available on my Outlook 2010. Still no joy on access. I went to iCloud.com and unchecked and rechecked the link to contacts, calendars and tasks. Still no joy. What is the problem? What should I do next ? Sorry I missed this earlier. Is it still not working? The registry key isn't needed with 2010 (and may have been disabled in 2010 and newer by later updates). What has helped many people is reinstalling icloud. Hi-- I have Office 365 on my macbook pro and have never been able to sync contacts, mail and calendar with iCloud. I read that there are communication issues with Office 365 and iCloud. Any ideas how I can get it to work? Thanks in advance. Correct, icloud calendar & contacts aren't supported in outlook for mac.I'm not aware of any way to make it work in outlook for mac, short of import/export. Sorry. Thanks for that advice. Has worked a treat. Either double click or Right click on this link https://www.slipstick.com/doit/AllowUnregisteredMapiServices.reg. If offered to run or save, you can choose Run, if not, you'll need to choose the option to save the file. This should save it with the file name AllowUnregisteredMapiServices.reg if you use IE or Chrome - if it is saved as a text file (.txt extension), you'll need to show file extensions in File Explorer and remove .txt from the name. double click on the reg file to run it - you'll be asked to OK (or click Yes) 3 or 4 times. I had this issue a few weeks ago on a Surface Tablet running Win 10 and Outlook 2013. I applied the fix but in the 15.0 key (theres nothing in the 12.0) and it appeared to work. WIn 10 has done another update and it looks like the issue has returned. Any information on this error with outlook 2013/Win 10? when they released the june update, the key worked for all versions of outlook but was only intended for outlook 2007 - the later versions don't need it. For security reasons, the August update closed this security hole. If icloud is giving this error with outlook 2010 or newer, sign out of icloud, uninstall, reboot and reinstall icloud. That fixed it for others who had the error.